Elen is thrilled to welcome The Poinsett Bride from Greenville South Carolina as a new authorized retailer. Here we have Jennifer to the left of Elen, then Vikki (owner) and then Kim. 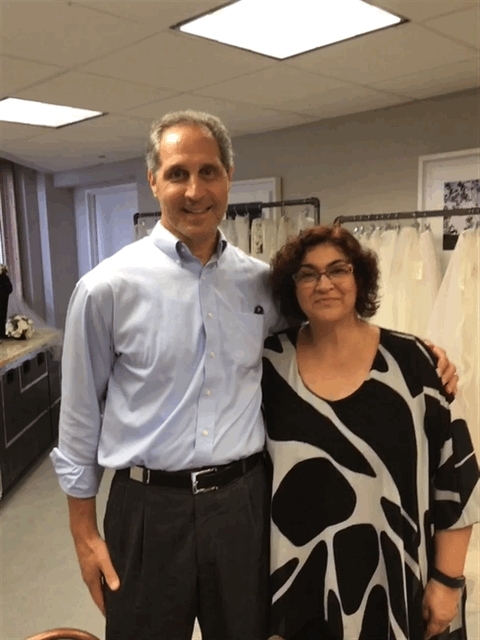 Steven (with Angie) is from Christina's Bridal of Andover in Massachusetts. Click on store name to visit their web site. It's such a pleasure to see Joelle each year in New York. Joelle comes all the way from Lebanon's (the country, not Lebanon NH :-) ) renowned L'Atelier Blanc in Beirut. It sure didn't take long for Nicole to establish herself in Kernersville North Carolina after her move from Vermont. The Magnolia Bride is the state's newest jewel.